Look in the Mirror: <br />What do We Need to Change? For those of you who follow my Twitter feed, you know I have been a little disgruntled about a paper that appeared in PNAS earlier this week. I think this paper may be the motivation behind a new documentary called "Cowspiracy" that Amanda Radke reported about on Monday. Jude Capper (a.k.a Bovidiva) really takes this paper to tasks and points out some serious flaws in the analysis. In addition to ignoring beef's benefits as a source of nutrients such as iron and B vitamins, the habitat that ranches create for livestock, and the ability to turn arid rangeland into food, the authors also miss that cattlemen can be an ally to conservationists. But, Jude Capper and other have sufficiently defended the beef industry. In this post, I want to take this opportunity for us as a beef industry to collectively take a look in the mirror. What do we need to learn from this research? 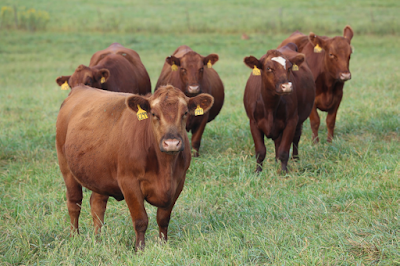 Despite errors in the analysis, should the beef industry decrease its use of feed grains? People such as John Wood, of US Wellness Meats, would probably say so. If we are interested in producing beef for a ground beef nation, do we need to grain finish cattle? If cattle can reach 90% of their mature mass on pasture at a young age, do we need feedlots to produce hamburger? One of beef's advantages over swine and poultry is the ability to use a rumen to turn grass into protein. As Scott Brown pointed out at the recent Cattlemen's Boot Camp, whether you are trying to succeed in the commodity or quality market, you need to be all in, not half way. Is a move away from feed grain a way to be all in for ground beef? I don't claim to be on expert on this, just throwing out ideas. One of the things I do know is that the beef industry has been a slower adopter of technology compared with the dairy, swine, and poultry industries. How much does this contribute to the differences in efficiencies? Perhaps this is a wake up call to more aggressively embrace new technology and correctly use older technologies (I'm looking at you birth weight EPD). But, rest assured, there is already research underway to address feed efficiency in beef. Visit http://www.beefefficiency.org/ to learn more. 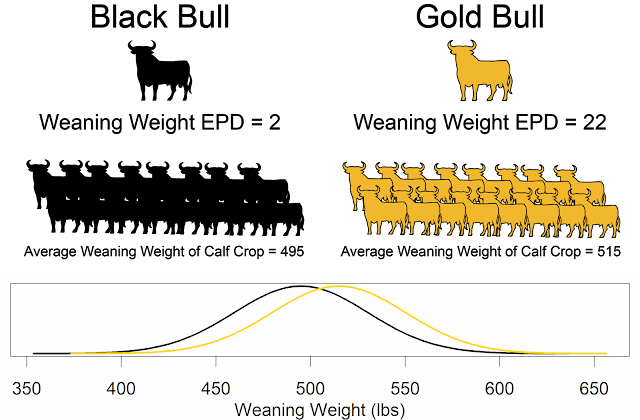 In addition to evaluating differences in gene expression, microbial populations, and mitochondrial differences in efficient and inefficient cattle, the research has produced genomic predictions for feed efficiency. These genomic predictions should be release to the beef industry in the next year, allowing beef producers to make genetic progress for feed efficiency. The team has already produced decision support tools to help cattle producers improve their herd's efficiency (more on this in a future post). With economic pressures from within the beef industry,and growing pressures from outside the industry, cattle producers need to latch on to these technologies. As a fan of beef cattle, one of the domesticated species that lead to my ancestors success over hunter gathers, I hope beef will be on dinner plates for a long time.